Hacking Infinity – Iris van Herpen Fall 2015 RTW. Model: Iekeliene Stange. Photo: Frederik Heyman. Image: Iris van Herpen. 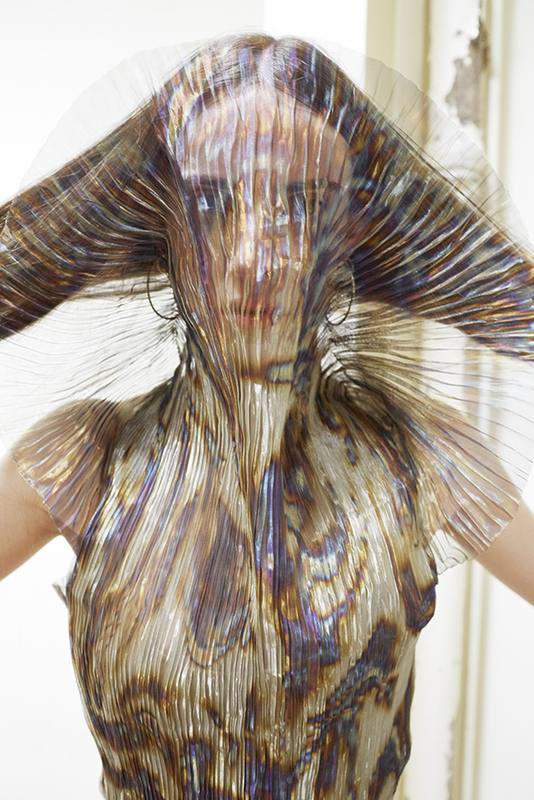 SHOWstudio’s latest Design Download is a dress by Dutch wunderkind Iris van Herpen. Iris van Herpen’s Hacking Infinity dress. Model: Bethany Sophara Robbins. Photo: Thomas Alexander. Image: SHOWstudio. Iris van Herpen dress, FW15 rtw. Model: Bethany Sophara Robbins. Photo: Thomas Alexander. Image: SHOWstudio. The sheath dress is from Hacking Infinity, Iris van Herpen’s Fall 2015 ready-to-wear collection, which explored the idea of terraforming. 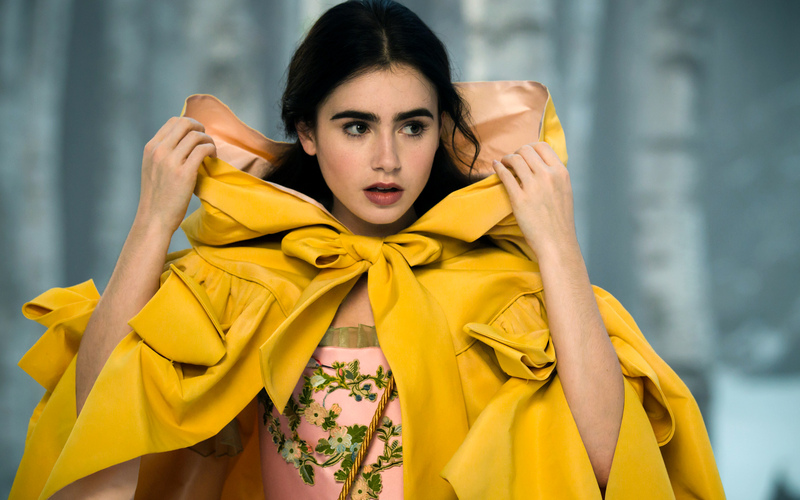 (Read more at the designer’s site, or see Suzy Menkes on her 2015 studio visit.) The collection’s leather and 3D-printed shoes are by Noritaka Tatehana. Iris van Herpen Fall 2015 RTW. Photo: Kim Weston Arnold. Image: Vogue Runway. Iris van Herpen Fall 2015 ready-to-wear. Image: firstVIEW. 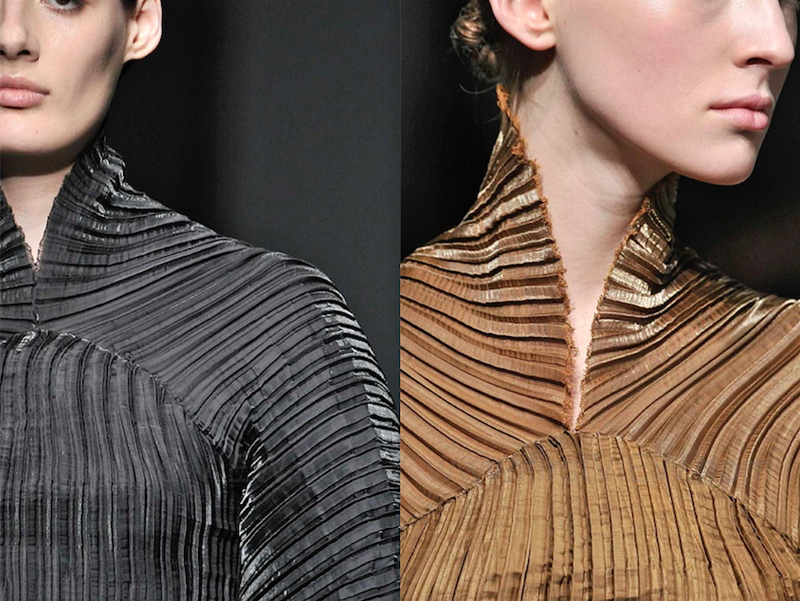 Science, technology, and science fiction are strong influences for Van Herpen, and Vogue’s reviewer cited Paul Verhoeven’s Total Recall as an intro to the terraforming concept. Several looks referenced the stillsuits from David Lynch’s Dune. Iris van Herpen Fall 2015 RTW. Photos: Team Peter Stigter. Images: Iris van Herpen. 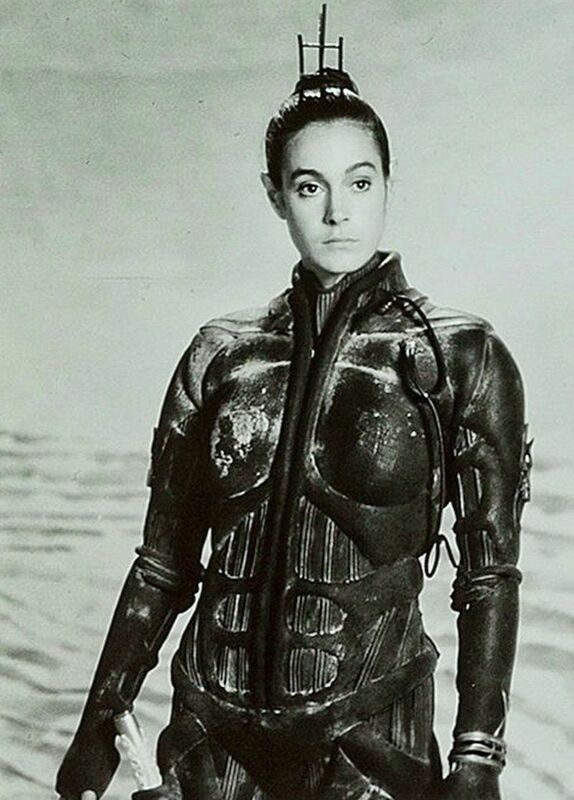 Chani (Sean Young) in David Lynch’s Dune (1984) Costume design: Bob Ringwood. Image: Pinterest. The plissé material, seen in the SHOWstudio piece, appeared both as one element in a mix, and for entire garments in black and bronze. Iris van Herpen Fall 2015 RTW. Images: firstVIEW. For Fall 2015, Van Herpen developed a fine, metallic fabric woven from silk and stainless steel. The translucent silver material was coaxed into “a sheen of nebula-like colors” with heat and hand-burnishing. Plisséed and pleated into circular forms, it evoked planetary bodies and infinity. Detail backstage at Iris van Herpen’s Fall 2015 show. Photo: Morgan O’Donovan. Image: Facebook. Iris van Herpen dress in T Magazine, April 2015. Photo: Juergen Teller. Image: Iris van Herpen. The pattern download comes in A4 sheets, with a test line to check the scale. Iris van Herpen dress pattern diagram. Image: SHOWstudio. Notes: Prints on 100 A4 sheets. 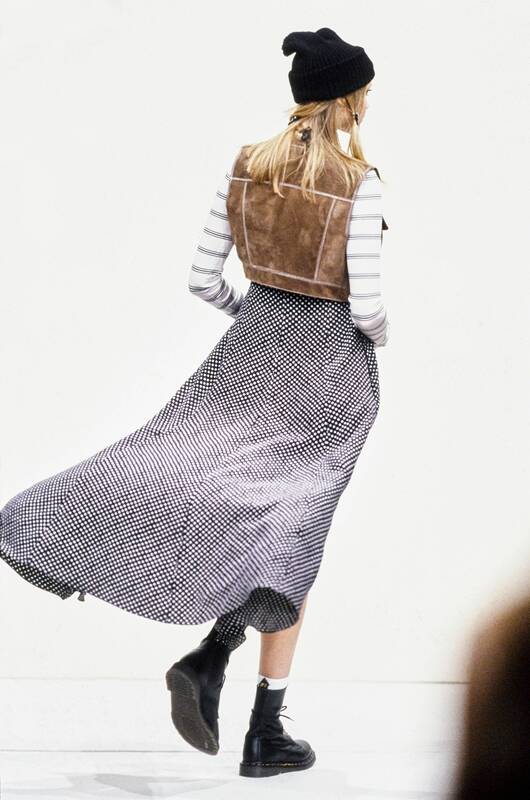 Plissé panels are hand-sewn to base dress. Fabric recommendations: Plissé panels: plissé or printed fabric on a cotton base fabric. Stretch fabric is recommended for the skirt. Straps & facings: silk, non-stretch fusible interfacing. 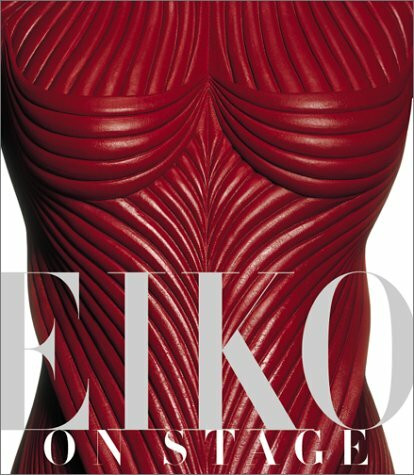 Lining: silk or cupro. The competition is still open. Will you be entering? 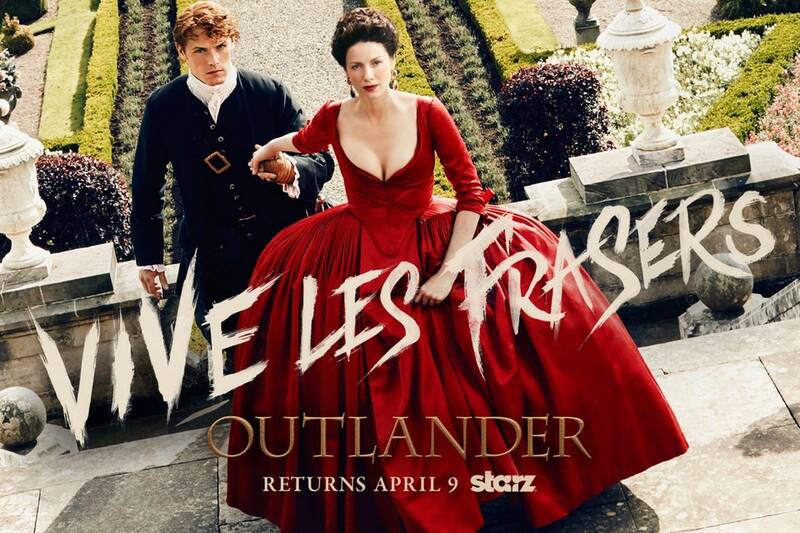 Promotional image for Outlander, season 2 (2016). Image: Starz. In honour of Burns Night, a guide to Outlander patterns. Outlander is now in its fourth season; it’s been renewed for two more. 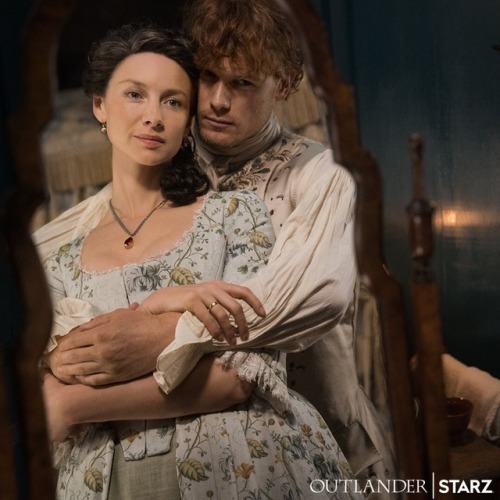 Adapted from the popular series by Diana Gabaldon, the time-travelling romance has plenty of source material: Gabaldon is currently working on her ninth Outlander book. Jamie Fraser (Sam Heughans) and Claire (Caitríona Balfe) in Outlander, season 1 (2014-15). Image: Harper’s Bazaar. 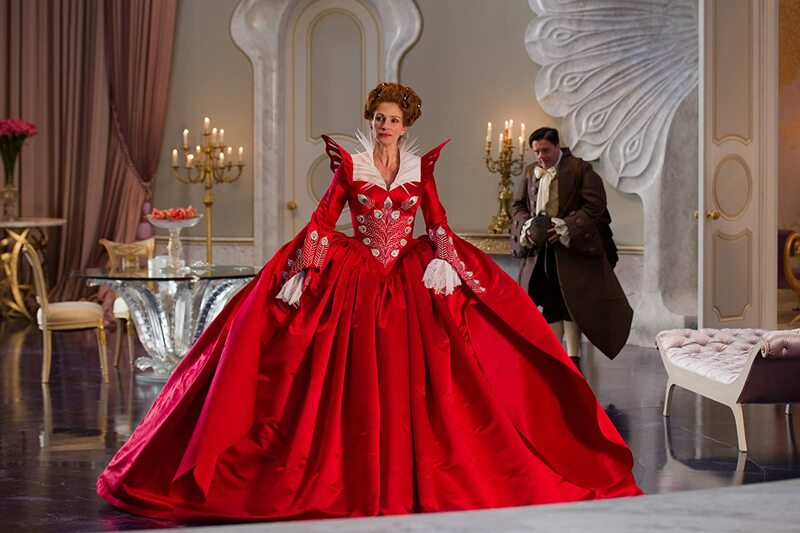 Sunday’s season finale will be the last episode to feature costumes by Terry Dresbach. 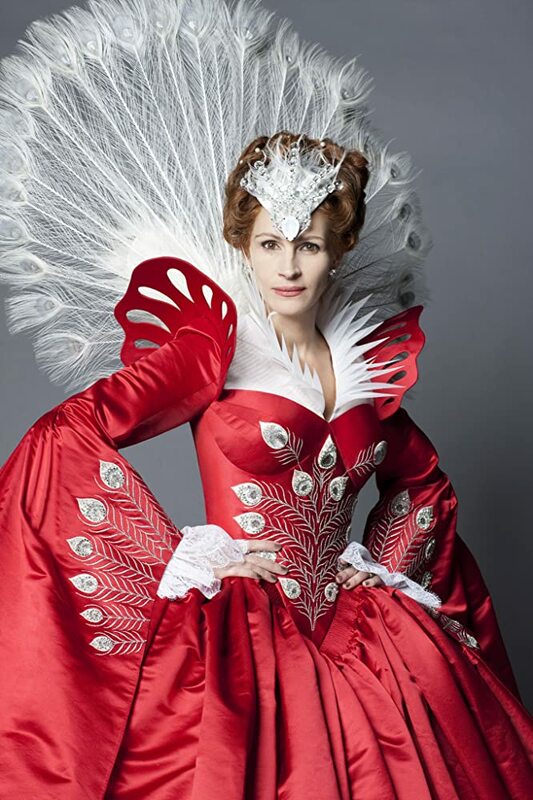 Trisha Biggar is the new costume designer for season 5. Biggar, who is from Glasgow, is best known for her work on the Star Wars prequel trilogy. In 2017, Simplicity’s unofficial Outlander patterns prompted Dresbach to take down her website. (It’s back now.) 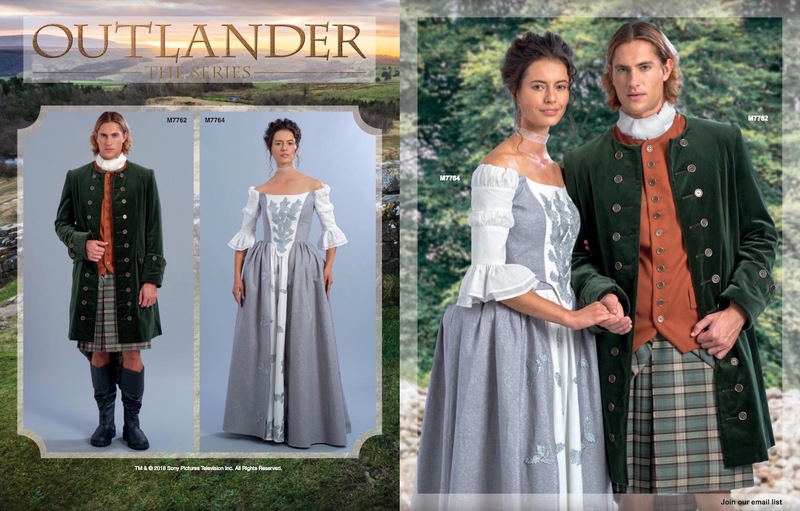 The next year, McCall’s started releasing official, licensed Outlander patterns. 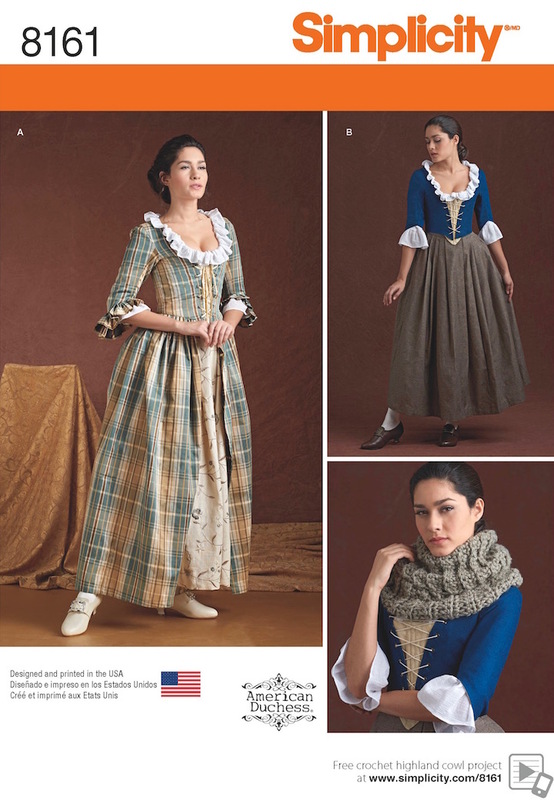 Fall Through Time – American Duchess’ Outlander costume, Simplicity 8161. Image: Simplicity. 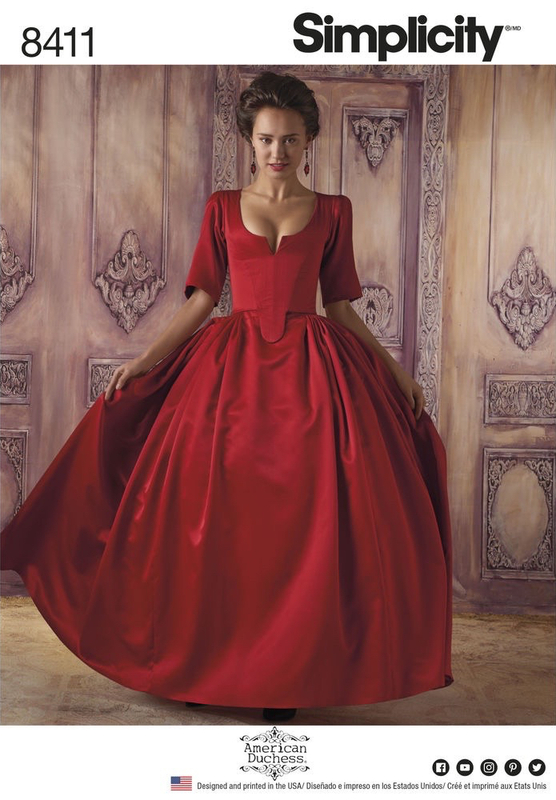 Simplicity’s adapted-from-Outlander patterns are by American Duchess, a historical costuming company based in Reno, Nevada. 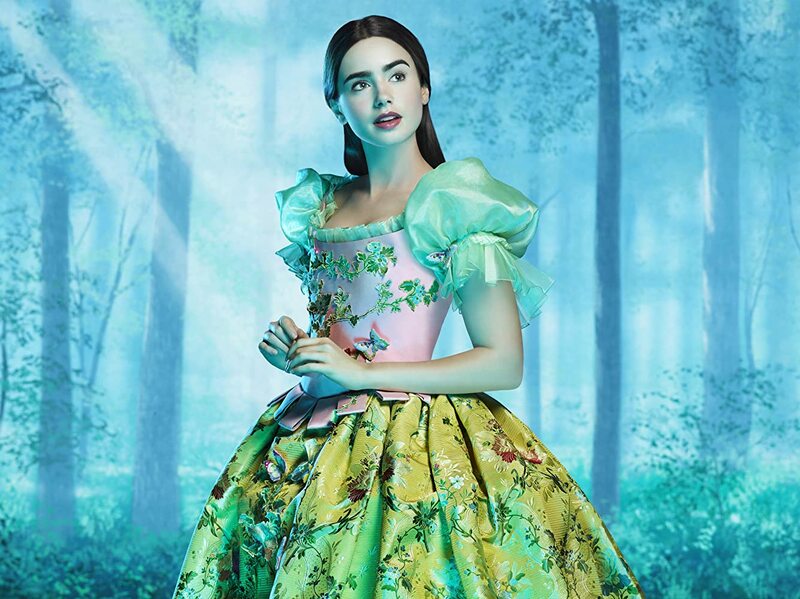 The three patterns are based on Claire’s costumes in seasons 1 and 2: 18th-century Highland dress and an unusual court gown. There’s also a free pattern for her crocheted cowl. Simplicity 8161 by American Duchess (2016) Image: Simplicity. Simplicity 8162 by American Duchess (2016) Image: Simplicity. It was this version of Claire’s red dress that caused such consternation online. 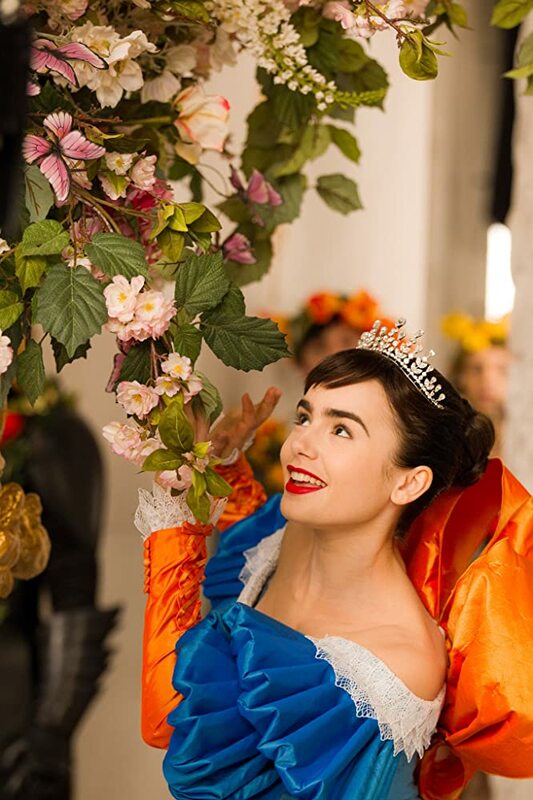 Claire wears the original during her visit to Versailles in “Not in Scotland Anymore,” the episode that earned Outlander its first Emmy nomination for costume design. 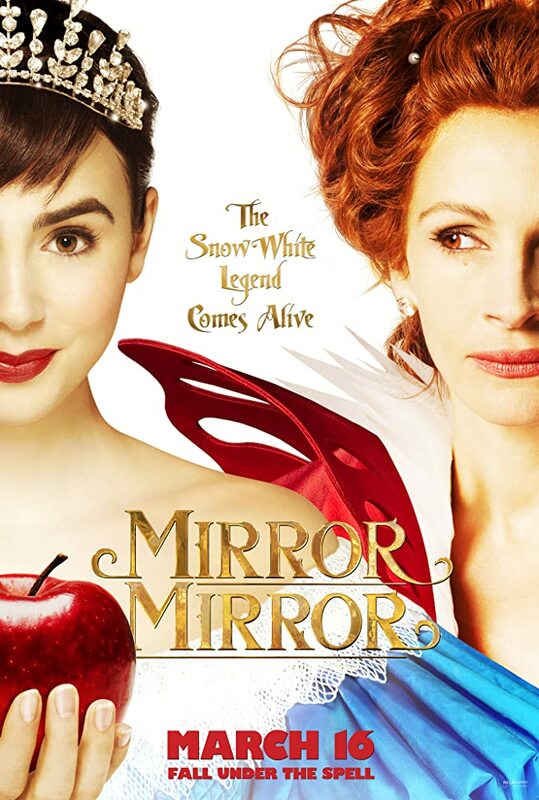 It was also seen in promotional materials for season 2 (see top of post). The pattern is still in print, but as with Simplicity’s Game of Thrones patterns, the colour was soon changed to a less provocative teal. Simplicity 8411 by American Duchess (2017) Image: Simplicity. McCall’s started licensing official Outlander patterns in 2018. (Company founder James McCall was a Scottish immigrant, and McCall’s UK — McCalls Ltd — is not a pattern company, but a Highlandwear outfitters.) 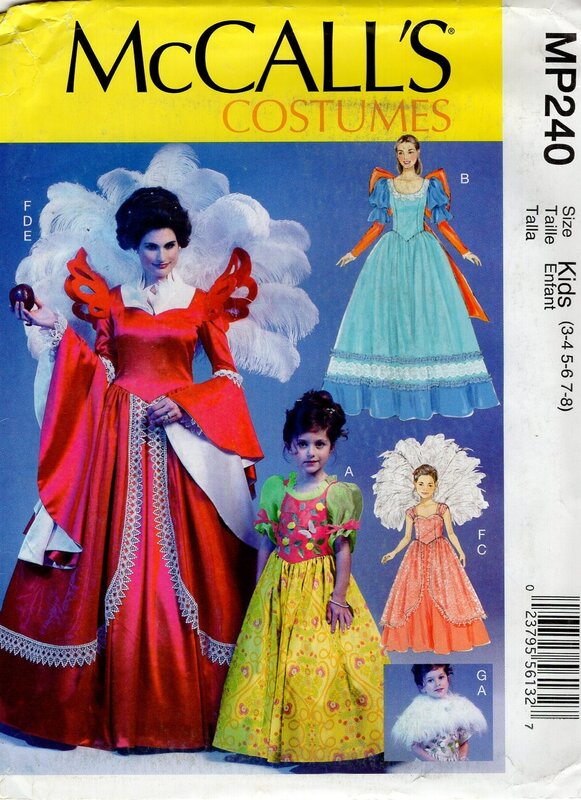 McCall’s Outlander patterns cover both women’s and men’s costumes, with many available as instant downloads. For the first few releases this meant Claire and Jamie Fraser, or 18th-century Scottish highlander garb. 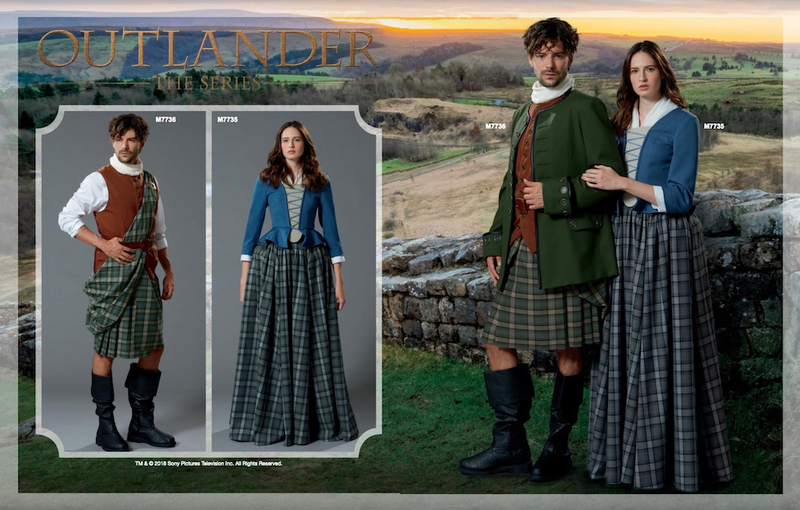 Outlander costumes M7736 and M7735 in McCall’s Spring 2018 lookbook. Image: McCall’s. Jamie Fraser (Sam Heughans) and Claire (Caitríona Balfe) in Outlander, season 1 (2014-15). Image: Starz. Alternate look for kilt M7736. Image: Starz. 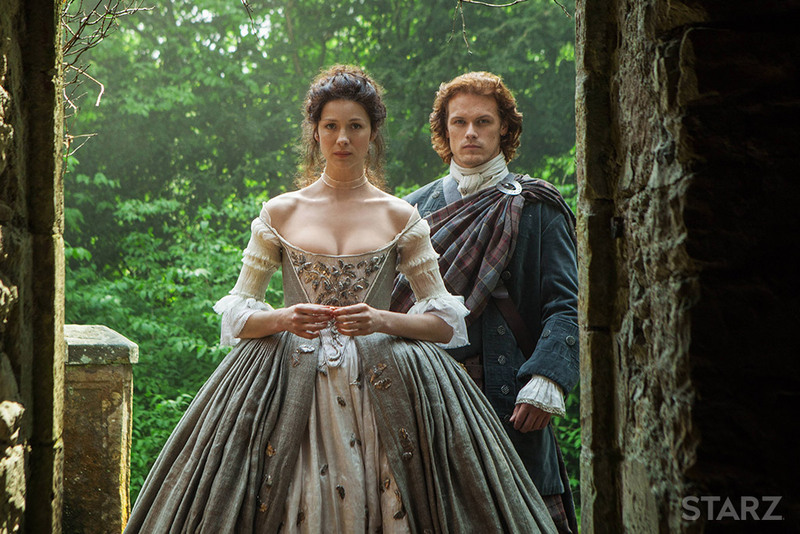 Next came the couple’s wedding clothes: Jamie’s frock coat and Claire’s wedding dress. 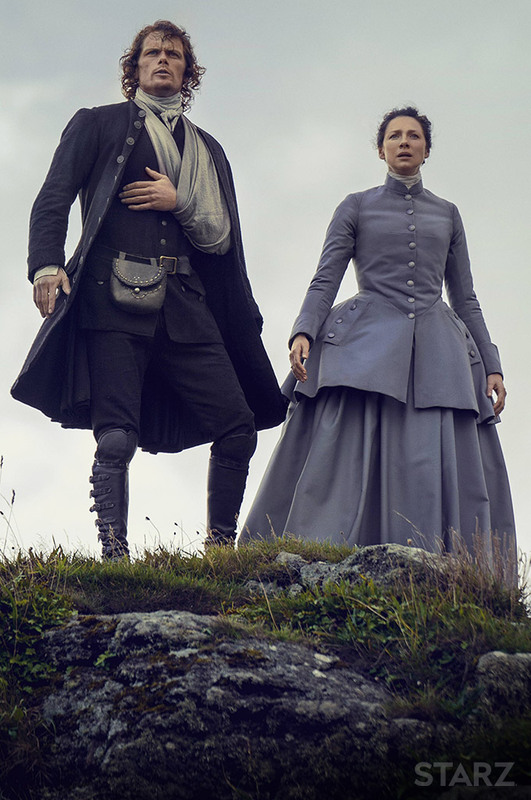 Outlander costumes M7762 and M7764 in McCall’s Spring 2018 lookbook. Image: McCall’s. Outerwear was the focus of the Summer release, with patterns for Claire’s fur-trimmed riding jacket and Jamie’s leather coat. 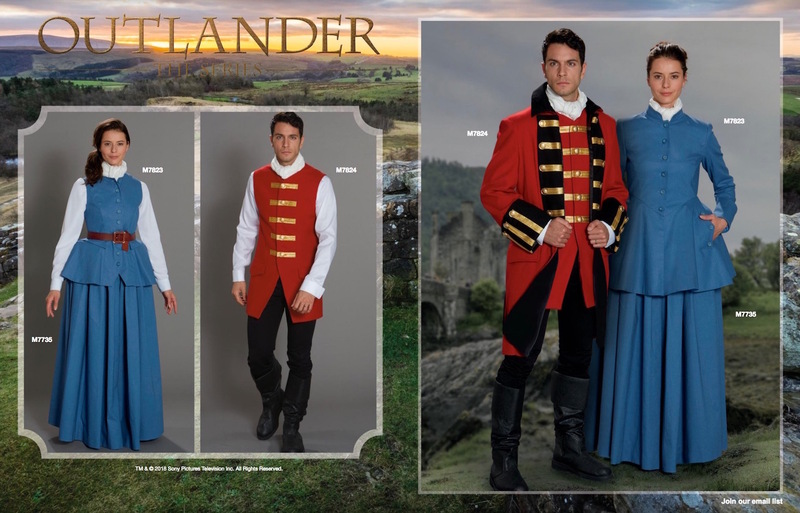 Outlander costumes M7792 and M7794 in McCall’s Summer 2018 lookbook. Image: McCall’s. Claire (Caitríona Balfe) in Outlander, season 1 (2014-15). Image: Terry Dresbach. Jamie Fraser (Sam Heughans) in Outlander, season 1 (2014-15). Image: Starz. 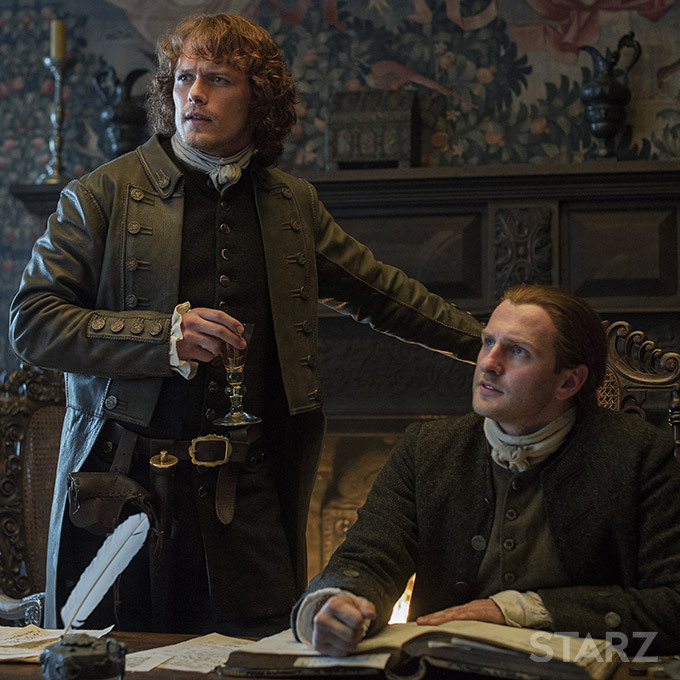 Jamie is still wearing the coat in season 2, when he joins up with Bonnie Prince Charlie. Dresbach suited the latter not in the Stuart, but the MacQueen tartan. 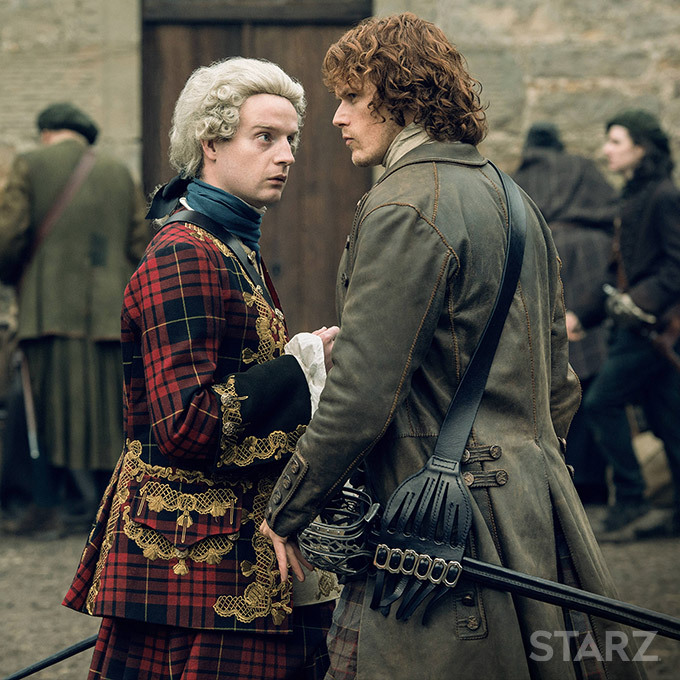 Charles Stuart (Andrew Gower) and Jamie Fraser (Sam Heughans) in Outlander, season 2 (2016). Image: Starz. 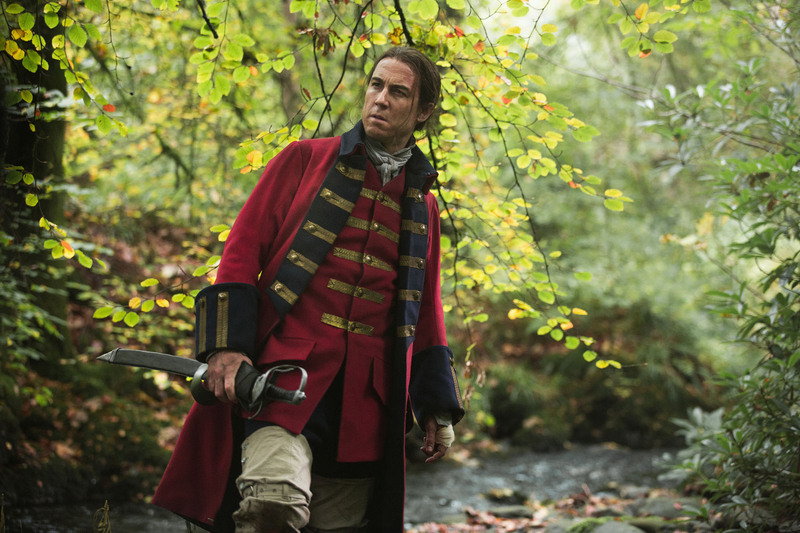 This fall, we finally saw a costume for British officer Jonathan “Black Jack” Randall, plus Claire’s blue riding jacket-and-waistcoat combo from season 3’s Emmy-nominated episode, “Freedom & Whisky.” The title is a Burns quote, and the episode sees Claire sewing the outfit herself, for time travel. A costume book lies open by her sewing machine, and her ensemble looks to be based on a memorable riding habit in Janet Arnold’s classic, Patterns of Fashion. 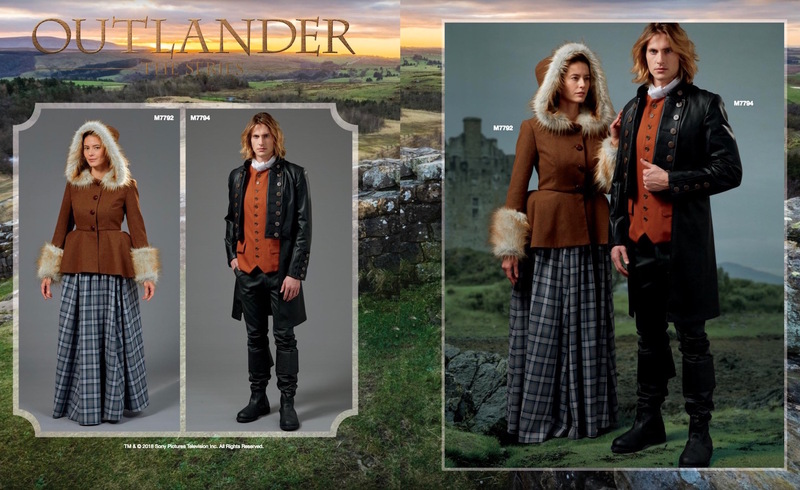 Outlander costumes M7823 and M7824 in McCall’s Early Fall 2018 lookbook. Image: McCall’s. Black Jack Randall (Tobias Menzies) in Outlander. Image: Starz. 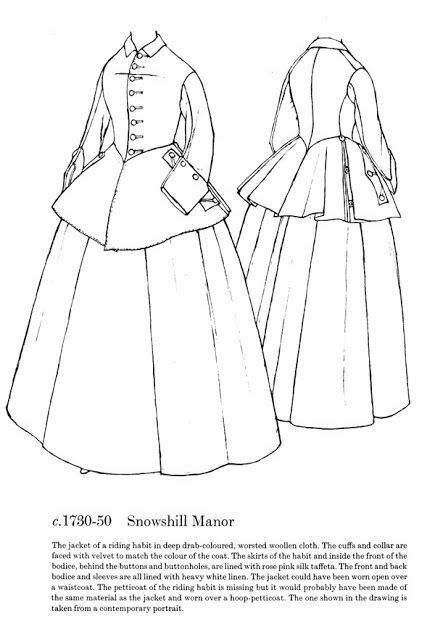 The Snowshill Manor riding habit in Janet Arnold’s Patterns of Fashion 1 (1964). Image: Pinterest. Jamie Fraser (Sam Heughans) and Claire (Caitríona Balfe) in Outlander, season 3 (2017). Image: Starz. This year, McCall’s Outlander patterns caught up to the show with this caraco jacket and skirt. The jacket looks to be one of Claire’s remade outfits, courtesy of Jamie’s aunt Jocasta. Outlander costume M7916 in McCall’s Early Spring 2019 lookbook. Image: McCall’s. Claire (Caitríona Balfe) and Jamie Fraser (Sam Heughans) in Outlander, season 4 (2018-19). Image: tumblr. Slàinte! To freedom and whisky. Outlander costume M7940 in McCall’s Spring 2019 lookbook. Image: McCall’s. Lauren Hutton with Warhol pillows. Photo: Gianni Penati. Image: flickr. A Vreeland-era Vogue Patterns editorial shows Lauren Hutton with silver, helium-filled pillows by Andy Warhol, who would have been 90 this year. Andy Warhol at the Leo Castelli Gallery, 1966. Photo: Stephen Shore. Image: Phaidon. Happy New Year, everyone! All the best for 2019. Lauren Hutton in Vogue, July 1966. Photo: Gianni Penati. Image: Youthquakers. 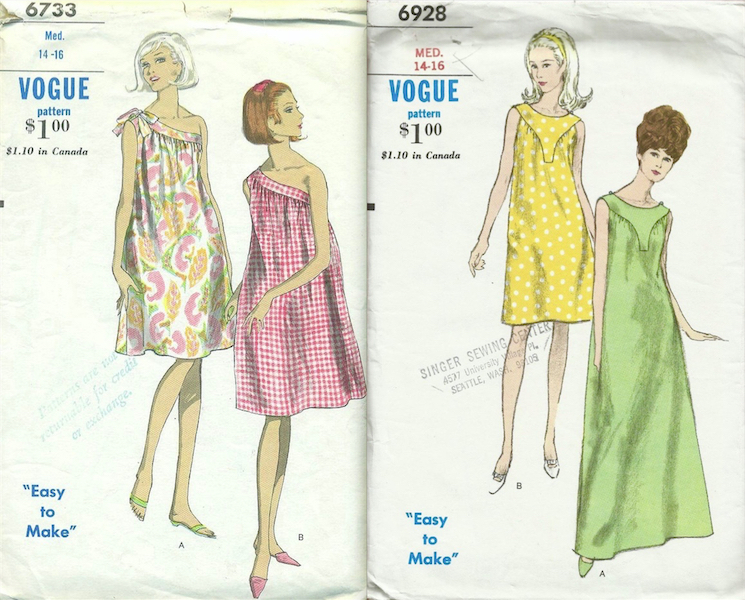 Pattern images: Mrs. Wooster, Vintage Pattern Wiki. Women in uniform on the cover of The Delineator, November 1918. Image: eBay. This Sunday is the centenary of the Armistice of 1918, marking the end of World War I. On the November 1918 Delineator cover shown above, two women wear military uniforms that could be sewn from a Butterick pattern. (Also pictured in the late Joy Emery’s book. Look inside the issue here.) Click the images below for my 1914 centenary post, Patterns for the Great War, and other patterns for war work. Responding to the Country’s Call, McCall’s magazine, July 1917. Image: eBay. Wartime skating in an aviation cap (left). McCall Fashions for January 1918.